It’s time to play! play! play! in this delightful board book! Let’s go out and play! play! play! We’ll have fun all day! day! day! This group of friends is ready for a fun-filled day! They have a race to see who wins, fly a plane, ride a train, play hide-and-seek, and much more. The rhyming text makes this the perfect readalong story! 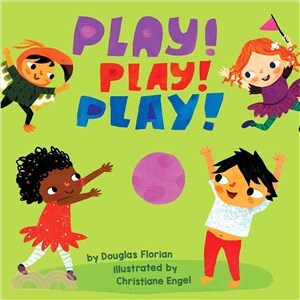 Douglas Florian is a critically acclaimed children's book author and illustrator. He is the author of The Wonderful Habits of Rabbits, which has received rave reviews, including a star from School Library Journal. He is also well known for his poetry collections, including Dinothesaurus, a Kirkus Reviews Best Book of the Year and a Junior Library Guild Selection; Bow Wow Meow Meow, a Parents Magazine Best Book of the Year; and many more. Florian is also a fine artist whose paintings have been exhibited in numerous art shows, and a former New Yorker cartoonist. He lives in Long Island, New York. Visit him online at douglasflorian.com. Christiane Engel is a children's book illustrator who loves creating quirky characters and unique maps. She also creates puzzles and animation. Christiane lives by the sea in southeast England with her family. Visit her online at chengel.myportfolio.com.